While the vacation is over for the Christensen family I have decided to continue with my unfocused musings. I am not sure how much I will do of this kind of thing in the future, but it means that I will write a bit more about other things than just monetary issues. My blog will still primarily be about money, but my readers seem to be happy that I venture into other areas as well from time to time. So that is what I will do. In recent weeks an very interesting war of words has been playing out between the two giants of Indian economic thinking – Jagdish Bhagwati and Amartya Sen. While I don’t really think that they two giants have been behaving themselves in a gentlemanly fashion the debate it is nonetheless an extremely interesting and the topic the are debate – how to increase the growth potential of the Indian economy – is highly relevant not only for India but also for other Emerging Markets that seem to have entered a “Great Deceleration” (see below). While Bhagwati has been arguing in favour of a free market model Sen seems to want a more “Scandinavian” development model for India with bigger government involvement in the economy. I think my readers know that I tend to agree with Bhagwati here and in that regard I will also remind the readers that the high level of income AND the high level of equality in Scandinavia were created during a period where all of the Scandinavian countries had rather small public sectors. In fact until the mid-1960s the role of government in Scandinavia was more limited than even in the US at the same time. Anyway, I would recommend to anybody interested in economic development to follow the Bhagwati-Sen debate. Nupur Acharya has a good summery of the debate so and provides some useful links. See here. 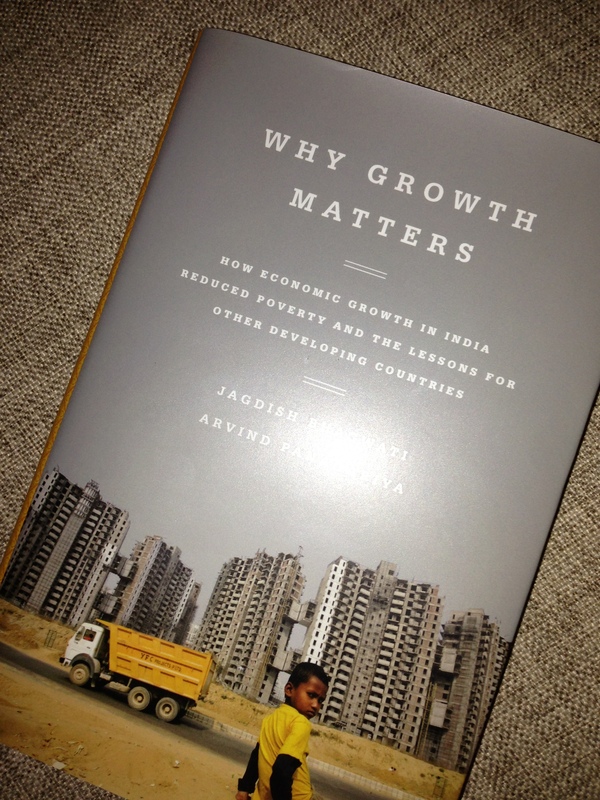 By the way this is Bhagwati’s new book – co-authored with Arvind Panagariya. Both Bhagwati and Sen are what we call Superstar economists. Other superstar economists are people like Tyler Cowen and Paul Krugman. Often these economists are also bloggers. I could also mention Nouriel Roubini as a superstar economist. I have been thinking about this concept for a while and have come to the conclusion that superstar economists is the real deal and are extremely important in today’s public debate about economics. They may or may not be academics, but the important feature is that they have an extremely high public profile and are very well-paid for sharing their views on everything – even on topics they do not necessarily have much real professional insight about (yes, Krugman comes to mind). In 1981 Sherwin Rosen wrote an extremely interesting article on the topic of The Economic of Superstars. Rosen’s thesis is that superstars – whether in sports, cultural, media or the economics profession for that matter earn a disproportional high income relative to their skills. While, economists or actors with skills just moderately below the superstar level earn significantly less than the superstars. I think this phenomenon is increasingly important in the economics profession. That is not to say that there has not been economic superstars before – Cassel and Keynes surely were superstars of their time and so was Milton Friedman, but I doubt that they were able to make the same kind of money that Paul Krugman is today. What do you think? The front page of The Economist rarely disappoints. This week is no exception. The front page headline (on the European edition) is “The Great Deceleration” and it is about the slowdown in the BRIC economies. I think the headline is very suiting for a trend playing out in the global economy today – the fact that many or actually most Emerging Markets economies are loosing speed – decelerating. While the signs of continued recovery in the developed economies particularly the US and Japan are clear. The Economist rightly asks the question whether the slowdown is temporary or more permanent. The answer from The Economist is that it is a bit of both. And I agree. There is no doubt that particularly monetary tightening in China is an extremely important factor in the continued slowdown in Emerging Markets growth – and as I have argued before China’s role as monetary superpower is rather important. With tensions already running high three weeks after the military ousted president Mohamed Morsi, General Abdel Fattah al-Sisi’s call for demonstrations raises the prospect of further deadly violence. …Sisi made his unprecedented move in a speech broadcast live on state television. 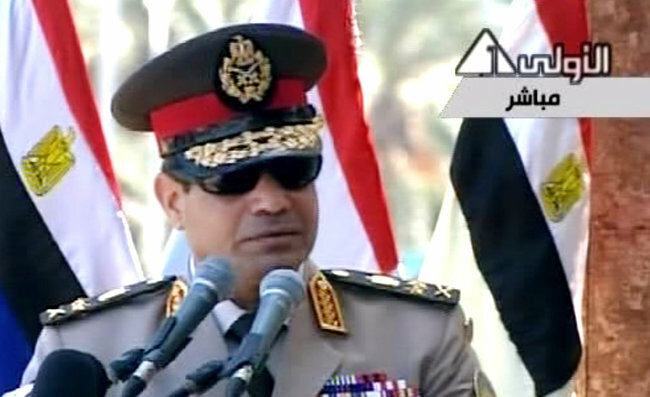 “Next Friday, all honourable Egyptians must take to the street to give me a mandate and command to end terrorism and violence,” said the general, wearing dark sunglasses as he addressed a military graduation ceremony near Alexandria. You can judge for yourself, but I am pretty skeptical that this is going to lead to anything good – and certainly not to (classical) liberal reforms. Just take a look at this guy – is that the picture of a reformer? I think not. While one can certainly question Mr. Cable’s wording it is hard to disagree that the aggressive tightening of capital requirements by the Bank of England is hampering UK growth. Or rather if one looks at tighter capital requirements on banks then it is effectively an tax on production of “private” money. In that sense tighter capital requirements are counteracting the effects of the quantitative easing undertaken by the BoE. Said in another way – the tight capital requirements the more quantitative easing is needed to hit the BoE’s nominal targets. That is not to say that there are not arguments for tighter capital requirements particularly if one fears that banks that get into trouble in the future “automatically” will be bailed out by the taxpayers and the system so to speak is prone to moral hazard. Hence, higher capital requirements in that since is a “second best” to a strict no-bailout regime. However, the tightening of capital requirements clearly is badly timed given the stile very fragile recovery in the UK economy. Therefore, I think that the Bank of England – if it wants to go ahead with tightening capital requirements – should link this the performance of the UK economy. Hence, the BoE should pre-annonce that mandatory capital and liquidity ratios for UK banks and financial institutions in general will dependent on the level of nominal GDP. So as the economy recovers capital and liquidity ratios are gradually increased and if there is a new setback in economy capital and liquidity ratios will automatically be reduced. This would put banking regulation in sync with the broader monetary policy objectives in the UK. Economic being the operative word (and I’d also add a “some” in there). Pinochet’s regime was anything but liberal in every other respect: Civil freedoms in general were heavily restricted. Also, many reforms were conducted in a highly irregular fashion. For example, too many privatized companies ended up in the hands of people closely tied to the regime. I was exactly thinking of that Pinochet picture when I saw the picture of general Sisi. It is exactly the same. I hope I did not give the impression that I was defending the Pinochet regime. I have been very clear in the past about what I basically consider to be a criminal regime. However, Pinochet nonetheless did reforms in certain area. But I again as I stated a “liberal dictatorship” is oxymoronic. Stratfor is making the case that the Egyptian military was willing to depose Mubarak because his son had studied economics and was planning to implement liberal economic reforms, and Mubarak was getting old and wanted to pass the mantle to his son. The military owns or controls almost everything of value in Egypt.